By Keith Cowing on March 31, 2011 12:54 AM. "NASA's Douglas Cooke said that NASA understands the direction provided by the NASA Authorization Act of 2010 and is honoring those requirements. And while the agency has not yet finalized its development plans for the Space Launch System and Multipurpose Crew Vehicle, Mr. Cooke told the Subcommittee that NASA "is working expeditiously to ensure it has a credible and integrated plan with which to move forward." He also said that NASA recognizes that Congress wanted more information than the agency was able to provide in a January 2011 interim report and identified late June as the timeframe the agency is targeting for providing Congress with a final report." "The President abandoned the Constellation program in his budget, calling for it to be cancelled with no solid alternative or plan for the future. By so doing, he set our human space flight program dangerously adrift with vague milestones for the world's premiere space exploration organization. "Last year, Congress and the Administration agreed on an Authorization Bill that focused on developing goals after the Space Shuttle's retirement. This included plans for a new heavy lift capacity while giving limited support to commercial operations. "Unfortunately, the President's proposed budget is a substantial departure from the Authorization Bill that he signed into law in October--cutting $2 billion from the heavy lift program while increasing taxpayer subsidies for the low earth orbit commercial space companies." By Keith Cowing on March 30, 2011 5:58 PM. *	Low-flight-rate HLLV dominated by high unique fixed costs. Use of CLVs eliminates these costs and spreads lower fixed costs over more flights and other customers. *	Use of large re-fueled cryo stages save DDT&E/ops costs for advanced propulsion stages (e.g., SEP)"
By Keith Cowing on March 30, 2011 8:39 AM. "NASA astronaut Doug Wheelock was honored with a Shorty Award for an image of the moon he took and posted to his Twitter account, @Astro_Wheels, while living aboard the International Space Station last year. 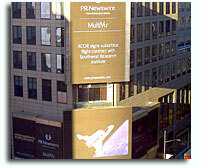 The awards ceremony was held at the TimesCenter in New York City on Monday, March 28." By Keith Cowing on March 30, 2011 7:41 AM. "Early this morning, at 5:20 am EDT, MESSENGER captured this historic image of Mercury. This image is the first ever obtained from a spacecraft in orbit about the Solar System's innermost planet. Over the subsequent six hours, MESSENGER acquired an additional 363 images before downlinking some of the data to Earth. The MESSENGER team is currently looking over the newly returned data, which are still continuing to come down. Tomorrow, March 30, at 2 pm EDT, attend the NASA media telecon to view more images from MESSENGER's first look at Mercury from orbit." By Keith Cowing on March 30, 2011 12:00 AM. "The OIG review found that six computer servers associated with information technology (IT) assets that control NASA spacecraft and contain critical data had vulnerabilities that would allow a remote attacker to take control of or render them unavailable. Moreover, once inside the Agency-wide mission network, the attacker could use the compromised computers to exploit other weaknesses we identified, a situation that could severely degrade or cripple NASA operations. We also found network servers that revealed encryption keys, encrypted passwords, and user account information to potential attackers." "Gail Robinson of the OIG's office tells Nature the IG can't say publicly which systems are affected for security reasons, but that it has told NASA the information. Although only six examples were documented, the IG report makes clear that up to 130 systems could be affected by the inconsistent oversight." "Anup Ghosh, founder and chief scientist for Invincea, noted that events like the recent attacks against HBGary, RSA, and Comodo, and this audit report from NASA might lead IT admins to ask: "If it is happening to organizations like these, can it happen to us?" But, Ghosh says the better question to ask is: "If it is happening to the top security companies, is it happening everywhere?" Ghosh volunteers the answer to that question, saying it is undoubtedly "yes"." "What's the problem? The OIG said NASA has been slow to act on a recommendation it made in May 2010 that NASA secure its networks. At that point, the OIG told NASA to immediately establish an IT security oversight program for its mission network, but as of February 2011, NASA had done nothing." "NASA CIO Linda Cureton, in a letter to the IG, generally concurred with the IG's recommendations, saying she will work with mission directorates and centers to develop a comprehensive approach by Sept. 30 to ensure that Internet-accessible computers on NASA's mission networks are routinely identified, vulnerabilities are continually evaluated and risks are promptly mitigated. In addition, Cureton said she will develop and implement a strategy for conducting an Agency-wide risk assessment by Aug. 31." By Keith Cowing on March 29, 2011 1:55 PM. Keith's note: This photo was taken during the STS-133 mission. Shuttle and ISS crew members pose with a printout of one of the photos taken of the Discovery's ascent into space by the Robonaut-1 balloon flown by Quest for Stars in collaboration with the Challenger Center for Space Science Education. Larger view. By Keith Cowing on March 29, 2011 12:52 AM. "It's made out of chicken fat, actually," said Langley's Bruce Anderson, AAFEX II project scientist. "The Air Force bought many thousands of gallons of this to burn in some of their jets and provided about 8,000 gallons (30,283 liters) to NASA for this experiment." Anderson and his team will test a 50-50 mix of biofuel and regular jet fuel, biofuel only, and jet fuel only. The jet fuel is Jet Propellant 8, or JP-8, a kerosene-like mix of hydrocarbons." By Keith Cowing on March 28, 2011 5:41 PM. "The central focus of a hearing earlier this month of the House Science, Space, and Technology Committee was whether NASA's FY 2012 budget request was a path forward for the space agency. Echoing comments heard a year ago, many committee members are unconvinced that the Administration's plan to use commercial transportation services to fly American astronauts to the space station will work." By Keith Cowing on March 28, 2011 2:44 PM. "In honor of those affected by the Tohoku-Kanto Earthquake in Japan, Russian cosmonaut and Expedition 27 commander Dmitry Kondratyev (center), European Space Agency astronaut Paolo Nespoli and NASA astronaut Cady Coleman are pictured with paper cranes (origami craft), which they folded to be placed in the Kounotori2 H-II Transfer Vehicle (HTV-2). The HTV2 is scheduled to undock from the International Space Station at 11:45 a.m. EDT on March 28, and re-enter Earth's atmosphere on March 29, 2011." By Keith Cowing on March 28, 2011 11:05 AM. "Based on our review of the final performance reports from the involved contractors and discussions with NASA officials, we concluded that the performance results on the JWST Recovery Act activities fulfilled the intent of the Recovery Act, and for tasks that were not completed within the planned period of performance, delays were justified appropriately." By Keith Cowing on March 28, 2011 9:03 AM. "There is a cottage industry these days - inside and outside of NASA - wherein people speculate what Heavy Launch Vehicle (HLV) design NASA is or is not pursuing. Everyone has Powerpoint charts, meeting notes, etc. but no one has all the facts. Nor are they likely to for months. The leaks have become a blur. NASA has not made its mind up yet and is not due to report back to Congress until June 2011 according to senior agency sources. That lack of clarity was evident in a presentation made by NASA Administrator Charles Bolden at a Space Transportation Association (STA) lunch briefing in Washington, DC on 25 March 2011." "In response to a question from NASAWatch editor Keith Cowing, Mr. Bolden explained that he does not think that the 130 metric ton lift capability prescribed in the law is necessary today and is not sure the agency can do it. He wants to build an "evolvable" launch vehicle, working in "small incremental steps [to] demonstrate that we can keep to cost and schedule and then people will begin to have confidence that we know what we're talking about.... There are things I do not know. ... I don't know what my 2011 budget is ... and that plays a critical role in what I can do." "However, it wasn't clear from Bolden's comments whether what emerged from those studies would meet the act's requirements for payload capacity and schedule. Asked why the agency could't just announce that it would develop the vehicle in the act, Bolden said, "Because I don't want to, for one thing, and because it may be that we can't do that. We don't know." (It's unclear whether Bolden meant that he doesn't want to build the SLS as specified in the act, or instead meant that he doesn't want to say now that NASA will build such a vehicle; he later claimed he meant neither of those things.)" "NASA already has run into trouble in the Senate over its plans for the heavy-lift launch vehicle Congress ordered in the three-year NASA authorization bill it passed and President Barack Obama signed late last year. Senators who helped draft that compromise between the Capitol and the White House are upset that the new budget request for fiscal 2012 doesn't move fast enough toward flying a big new rocket capable of sending humans beyond low Earth orbit." By Keith Cowing on March 25, 2011 6:12 PM. "Work has stopped on an alternative version of the instrument, with a pair of zoom-lens cameras, which would have provided additional capabilities for improved three-dimensional video. The installed Mastcam on the Mars Science Laboratory mission's Curiosity rover uses two fixed-focal-length cameras: a telephoto for one eye and wider angle for the other. 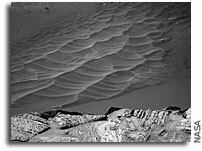 Malin Space Science Systems, San Diego, built the Mastcam and was funded by NASA last year to see whether a zoom version could be developed in time for testing on Curiosity." By Keith Cowing on March 25, 2011 11:29 AM. "LovelandPolitics has learned the 10% kickback to CAMT on all Gross Sales has caused considerable consternation by bidders who believe the city's redevelopment of the Agilent campus could be more successful without the ACE partnership by CAMT and their unfunded NASA 5-year collaboration agreement. As one bidder told LovelandPolitics, "We would need to lease 75% of all the renovated space before becoming profitable but without CAMT we would only need to lease 25% before seeing some return on our investment." By Keith Cowing on March 24, 2011 9:36 PM. "After a hibernation of about six months, the framing cameras on board NASA's Dawn spacecraft have again ventured a look into the stars. The spacecraft also powered up its visible and infrared mapping spectrometer, which investigates surface mineralogy, and the gamma ray and neutron detector, which detects elemental composition. The reactivation prepares the instruments for the May approach and July arrival at Vesta, Dawn's first port of call in the asteroid belt." By Keith Cowing on March 24, 2011 9:35 PM. "On Thursday, March 24 at about 4 p.m. PDT (7 p.m. EDT), NASA's Stardust spacecraft will perform a final burn with its main engines. Twenty minutes after the engines run dry, the spacecraft's computer will command its transmitters off. They actively shut off their radios to preclude the remote chance that at some point down the road Stardust's transmitter could turn on and broadcast on a frequency being used by other operational spacecraft. Turning off the transmitter ensures that there will be no unintended radio interference in the future." By Keith Cowing on March 24, 2011 1:22 PM. Washington Post: "The control tower at Reagan National Airport went silent early Wednesday, forcing two airliners carrying a total of 165 passengers and crew to land on their own. Both planes landed safely after their pilots took matters into their own hands, broadcasting their progress as they approached and landed. They were also communicating with controllers at a separate facility in the region that does not handle landings. 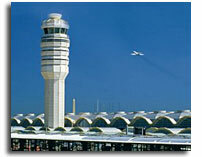 Read more about the air traffic incident. 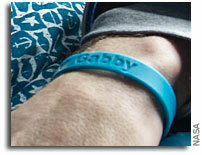 AUDIO: Listen to an audio transmission as an American Airlines pilot approached for a landing." "The agenda for the meeting includes the following topics: ... Air Traffic Management technology demonstration discussion." By Keith Cowing on March 24, 2011 12:02 PM. By Keith Cowing on March 24, 2011 9:32 AM. "On Thursday, March 24 at about 4 p.m. PDT (7 p.m. EDT), NASA's Stardust spacecraft will perform a final burn with its main engines. At first glance, the burn is something of an insignificant event. After all, the venerable spacecraft has executed 40 major flight path maneuvers since its 1999 launch, and between these main engines and the reaction control system, its rocket motors have collectively fired more than 2 million times. But the March 24 burn will be different from all others. This burn will effectively end the life of NASA's most traveled comet hunter." By Keith Cowing on March 24, 2011 8:24 AM. "That's not to say the Russians aren't exploiting their upcoming ridership monopoly by jacking up the price. They are, and the U.S. will have to live with it until it can field a new rocket and spacecraft. The fastest way to do that and end the dependence is for Congress to stop its endless fighting and reach a sensible compromise on a federal spending and deficit reduction plan that has Republicans and Democrats locked in trench warfare. ... Members of Congress can complain all they want about the Russians, and attack the White House, but they are the ones holding the next generation of spaceflight hostage. They should end their posturing and act." By Keith Cowing on March 23, 2011 8:23 PM. "Congress has again failed to rid a temporary spending bill of language forcing NASA to waste $1.4 million a day on its defunct Constellation moon program. This so-called "Shelby provision" -- named for U.S. Sen. Richard Shelby, R-Alabama, who inserted it into the 2010 budget -- is expected to cost NASA roughly $29 million during the three-week budget extension through April 8. It has already cost the agency nearly $250 million since Oct. 1." By Keith Cowing on March 23, 2011 8:43 AM. "A movie has been made on the space station that tries to show what Yuri Gagarin might have seen on his historic flight around the Earth in 1961. FirstOrbit is being released as a free download to celebrate the Russian cosmonaut's achievement 50 years on. No film exists showing what Gagarin saw through the viewports of his Vostok capsule; there is only an audio recording of his observations. This has now been matched to high-definition video shot from the station." By Keith Cowing on March 23, 2011 8:27 AM. "NASA's Ames Research Center in Moffett Field, Calif., has won two agency awards: the 2010 Government Invention of the Year Award and the 2010 Commercial Invention of the Year Award. Ames received the Government Invention Award for developing the Future ATM (Air Traffic Management) Concepts Evaluation Tool, or FACET, software that creates simulations for managing air traffic scenarios." Keith's note: Cool technology news. NASA wins external awards. Yawn. No mention on the NASA Chief Technologist's webpage. NASA CIO: Do As I Say - Not As I Do. By Keith Cowing on March 22, 2011 9:20 PM. NASA CIO staff continue to make their own rules when it comes to setting up websites outside the NASA firewall for official purposes - websites with no security in place, according to postings on the NASA Forward Maker Camp website. Keith's note: According to NASA GSFC's Jon Verville (@jonverve): "We are following the precedent set by OSTP/GSA here: http://expertnet.wikispaces.com/Getting+Started Please cite the NPR/NPD requirement which restricts the use of non-NASA websites." My response: "Your group is not operating this website according to NASA policy per NASA HQ. Precedents in other agencies do not count. Otherwise all NASA NPDs can be ignored since someone somewhere else always does things differently. Why have any rules at all?" I wonder what would happen if CIO staff were to randomly walk around the agency and ask people what would happen if they went out and set up their own website outside the firewall for a project they were working on - or ask management what their reaction would be if their staff just went off and did this. The answer should be obvious. It would certainly be nice if NASA were much more open in this regard - but it is not there yet. Instead of breaking the rules (or making them up ad hoc) these CIO staffers need to set an example and follow their own rules. And if the rules are not working, they need to cite the problems, and then then change the rules. Otherwise having rules of any sort is pointless. I fail to understand why NASA CIO sets standards that the entire agency has to follow when it comes to website hosting, security etc. and then their own staff can go do whatever they want in this regard. Why should anyone else at NASA bother to adhere to these rules - or pay attention to what the CIO says? Does the "precedent" that Verville mentions have any official bearing on NASA rules and regulations? If so, then where is the NPR/NPD that says so? Otherwise you can't just assume that you can do something simply because someone else did it. By Keith Cowing on March 22, 2011 8:20 PM. Keith's 21 March 9:20 pm EDT note: This Tweet was just posted by the Mars Reconnaissance Orbiter HiRISE Team: "We've been quiet lately. But we have a good reason." By Keith Cowing on March 22, 2011 8:05 PM. "NASA ushered in a new era of space exploration at its Wallops Flight Facility in Virginia on Tuesday with a ribbon cutting ceremony opening the new Horizontal Integration Facility (HIF). The HIF will support medium-class mission capabilities. The first customer to use the facility will be Orbital Sciences Corp. of Dulles, Va., with its Taurus II launch vehicle." Keith's 22 Mar 12:30 pm EDT note: There is no mention of this press release nor images and video of this event on the Wallops home page. Moreover, Wallops still hasn't fixed the link on their home page so that it points to their new Facebook page. Keith's 22 Mar 6:30 pm EDT update: Still no mention on the Wallops home page. Keith's 23 Mar 8:17 am EDT update: As it happens there is a page up about the event - but it was not linked from the WFF home page yesterday - rather, it was hidden. You could only find out about it if someone stumbled across it and sent you an email. 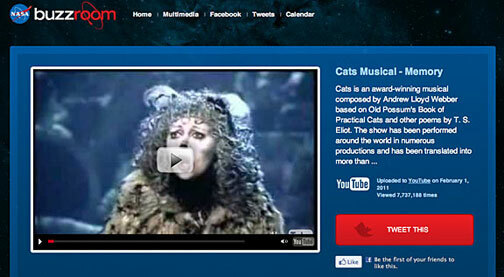 It is now linked from their home page - a day after the event. By Keith Cowing on March 22, 2011 8:02 PM. "After a safe mode event that lasted 144 hours, NASA's Kepler spacecraft returned to science data collection at 2:45 p.m. EDT Sunday, March 20. During the spacecraft's recovery from the safe mode event, the project team performed the spring quarterly roll and downloaded science data collected since Feb. 4 from the spacecraft's solid-state recorder. That data will be sent to the Kepler Science Operations Center at NASA's Ames Research Center, Moffett Field, Calif., where the science team will evaluate it. An anomaly response team will continue to evaluate the spacecraft data to determine the cause of the safe mode event." By Keith Cowing on March 22, 2011 12:24 PM. "United Launch Alliance (ULA) and XCOR Aerospace announced today their successful hot-fire demonstrations of a lighter-weight, lower-cost approach to liquid-fueled rocket-engine vacuum nozzles. The new nozzle technology, which uses aluminum alloys and innovative manufacturing techniques, is projected to be less costly and save hundreds of pounds of mass compared to nozzles in use today in typical large upper-stage rocket engine systems." By Keith Cowing on March 22, 2011 11:30 AM. "After a five-month stay aboard the International Space Station, astronaut Scott Kelly will be available for live satellite interviews on Tuesday, March 22, from NASA's Johnson Space Center in Houston. Kelly will be available from 6 to 8 a.m. CDT. The interviews will air live on NASA Television." Keith's 9:30 am EDT note: Why did NASA (or was it Scott Kelly) cancel all of those live interview shots this morning? NASA TV suddenly had dead air. Lots of TV networks and other media awere lined up in the queue. Keith's 11:30 am EDT update: JSC PAO just sent me this: "Scott Kelly discontinued his planned interviews this morning because the media repeatedly asked him about his personal family matters rather than his mission to the International Space Station. The media continued to inquire about personal family matters even after he and NASA PAO had repeatedly informed them that the focus of the interviews should remain on his mission." To be certain the Kelly family is absolutely entitled to their privacy on family issues such as this and the media should respect that - period. But what has me a little baffled is Scott's constant discussion of these issues on-orbit - including discussions with the President, photos of him wearing the wearing of the blue bracelet after landing, and other things related to Rep. Giffords. Why did he talk about this *during* his "mission to the International Space Station"? Either this is in or out of bounds - not both. As such, I can understand how the media was confused about the sudden change in ground rules. He's certainly made them clear now. Keith's 5:30 pm EDT update: Based on reader reactions and the Kelly family's reaction to the media I am inclined to simply ignore news about them whenever possible - regardless of the topic. Planetary Science Community Town Hall Meetings Across the U.S.
By Keith Cowing on March 21, 2011 7:31 PM. "In the face of declining budget projections, we as a community need to stand together and argue persuasively for NASA's program of planetary science and exploration. The decadal report can be a tool for helping us do that. It arose from our community, and it has the full weight of the National Research Council behind it. If we stay united, we can use it to argue effectively for a well-funded program that will give us the kinds of missions we all want to see in the years ahead. If our community fragments, though, we will be much less effective in arguing for planetary exploration over other budget priorities. Part of the process of letting the community learn more about the decadal survey is a series of town hall meetings that will be held around the country. These are being organized by the DPS. Here's the schedule as it now stands:"
By Keith Cowing on March 21, 2011 7:19 PM. By Keith Cowing on March 21, 2011 5:27 PM. "Dayna Steele is a (former) repeat client of PR by the Book and we also worked on her hubby's novel, Specific Impulse. Marika Flatt, founder of PR by the Book, asked Dayna to write a guest blog post for us when she saw her picture on Facebook of our friend, NASA Astronaut Cady, holding a copy of Charlie's book in space. Dayna & Charlie invited The Flatt family to tour the NASA Johnson Space Center a few years ago and their friend, Cady, gave them a personal tour. She's now on the International Space Station. Here's Dayna's advice ... Several people, including Charles Justiz the Wonder Husband have made the comment this past week "Wow, you still have it." Really? All I did was get a shot of Charlie's new thriller, Specific Impulse, in the hands of an astronaut. On the International Space Station. With Discovery parked outside the window. That's all. So, here's the question PR By The Book posed: How do you get such an out-of-this-world product placement, whether it is in space or within the constraints of gravity?" Keith's 1:10 pm EDT note: I was not aware that authors could get NASA astronauts to do on-orbit promotion and commercial "product placement" on the ISS unless there was a clear EPO tie-in, Space Act Agreement, etc. And now that "product placement" is part of an article on a professional PR on how to do "product placement". Who knew? If this was just a favor done by a friend for a friend (which is what I am pretty sure the intent was on Cady's part), that's fine. But to write about it as if it was "product placement" implies some commercial and PR angle. Not good. Curiously, last year at NASA Desert RATS, JSC PAO told me that I could not take any photos with astronauts in them and that if I did - and wanted to use the photos - that JSC PAO would need at least 3 days to process the request before giving permission - if they gave permission, that is. I was told by JSC PAO personnel that this rule did not apply to other NASA employees - only to astronauts. Keith's 5:27 pm EDT Update: This page has been pulled offline - but here is a cached version. By Keith Cowing on March 20, 2011 10:41 PM. "To be clear, we believe that NASA's budget can be reduced," the lawmakers wrote, urging Ryan to take aim at climate-monitoring programs poised for a funding boost over the next five years under the $18.72 billion budget blueprint U.S. President Barack Obama unveiled Feb. 14. "Within the NASA budget specifically, we believe there is an opportunity to cut funding within the Earth Science account where an overabundance of climate change research is being conducted." By Keith Cowing on March 20, 2011 9:43 PM. "European space scientists are scrambling to rethink--and redesign--massive potential missions after it was confirmed that NASA, whose budget is in disarray, won't contribute significant funding to any of the efforts. NASA's decision "means in principle that none of the three missions is feasible for ESA [European Space Agency]," notes Xavier Barcons of the Cantabria Institute of Physics in Spain." "NASA could be forced to impose a roughly $1 billion cap -- including launch costs -- on any new planetary flagship mission it undertakes this decade, far less than the U.S. National Research Council (NRC) recommended for this class of probe in its most recent survey of planetary priorities and more in line with what the agency spends on medium-sized missions." "The European Space Agency has postponed its selection of a large space mission to launch in the 2020-2021 timeframe, following advice from NASA that the US is unlikely to be able to contribute its share of funding to the winning selection. The selection of the so-called L-class mission had been expected to take place this June, but is now set for February 2012. "The decision was made very reluctantly," says David Southwood, Director of Science and Robotic Exploration at ESA Headquarters in Paris, France,"NASA could not meet our timetable to launch." "During a meeting with the Planetary Science Subcommittee of the NASA Advisory Council today, however, PSD Director Jim Green made clear that the total amount of funds he thinks he will have for a flagship mission is only $1 billion. The rest of the funds would have to come from an international partner." By Keith Cowing on March 20, 2011 9:37 PM. "Yuri's Night is excited to commemorate the 50th anniversary of human spaceflight by launching two contests: the "Call to Humanity" Space Exploration Ad Competition, which calls on talented graphic designers, artists, and other creative individuals to create a powerful and inspiring print campaign that will move people to think about and support humanity's future in space, and the "International Space Sweepstakes," a free global drawing." By Keith Cowing on March 20, 2011 12:25 PM. "NASA Forward Maker Camp is a participant-driven Maker Camp based on "code-a-thon" or "think tank" style events, with a heavy emphasis on tangible final products. It's our chance to do pursue projects of value to the NASA mission that would not normally be done and also to collaborate with others from around the agency who are doing interesting work in fields that we are trying to learn about. The NASA Forward Maker Camp is as good as participants make it, so be prepared to lead or participate in a project, ask interesting questions, show off what you've been working on, or generally leave your mark on the event. ... The NASA Forward Maker Camp is tentatively scheduled for April 28-29, 2011"
Keith's note: Apparently this official NASA event is happening agencywide - yet there is no mention whatsoever at NASA.gov - only on a non-NASA website at wikispaces.com. NASA's CIO/Open Government Initiative Office is behind this but no mention is made at the CIO website. Curiously, the CIO is not shy about announcing events such as this one and this one. But when it comes to CIO's participation in events such as the NASA Forward Maker Camp and "Random Hacks of Kindness", the CIO individuals working on these projects go out of their way to limit the public visibility they provide in advance - thus limiting the participation of others outside their small community. Its rather ironic that the "Open Government" initiative office at NASA condones such "closed" behavior. That said, there is an interesting precedent being set here: all of the people involved in this activity work for the NASA CIO. They have set up this website totally outside of the NASA firewall, use the NASA logo, and are conducting government (NASA) business on this site in their official capacities. The wiki on this website is open for anyone, anywhere on Earth to join, read, and comment on. ANYWHERE. 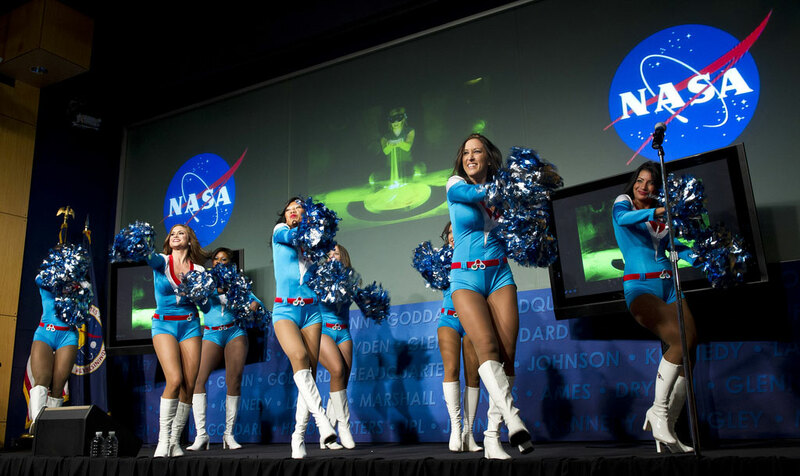 Since the CIO approves of this approach by their staff, will everyone else at NASA be allowed to do this too? No more security, firewalls, design standards? No adherence to Section 508, ITAR, and other government regulations that govern such things? Wow, THAT is really being "open". Don't get me wrong, I think events such like this are a great idea and they should be encouraged. But the closed way these CIO folks are going about it in terms of giving their efforts visibility and their total disregard for IT rules and regulations their office supposed to enforce, makes me wonder if anyone is really in total control of this organization. "Task: Generate a "How NASA Affects Your State" Map: Background: One challenge the NASA workforce faces is communicating its impact on the country to the public and politicians. This team could research the economic drivers for each state (e.g. California and agriculture) and match them to NASA Spinoff technology (e.g. don't know, but I'll find out), eventually generating an infographic. This infographic could act as a springboard for NASA employees (and others) to start a conversation about why NASA matters to its stakeholders. The NASA Spinoff App has something similar to this idea, but it is more focused on individuals in each state." By Keith Cowing on March 18, 2011 11:19 AM. "Shortly after the safe mode entry, the team analyzed the spacecraft data and determined all subsystems remained healthy. During recovery actions, the Deep Space Network was used to downlink telemetry and began recovery of files to assist in the anomaly analysis. The team has since successfully reinitiated power to the primary SIB, confirmed its health and status, and also verified the new version of the NIC firmware had loaded correctly, and passed a health and safety check. The star trackers have been powered on and the spacecraft has been commanded to standby orientation, with solar arrays aligned toward the sun and Kepler pointed to ecliptic north. Updates will be posted as the team makes progress in the recovery"
By Keith Cowing on March 18, 2011 8:23 AM. "On the same day that Robonaut 2, the first humanoid robot in space, emerged from his protective packaging onboard the International Space Station, its twin entertained a crowd back on Earth at the annual NASA Technology Day on Capitol Hill. Developed jointly by NASA and General Motors, Robonaut 2 (R2) is a robotic assistant that can work alongside humans--whether astronauts in space or workers in U.S. manufacturing plants. R2 also is a powerful example of the benefits of NASA partnerships and technology." "Journalists are invited to tour a NASA Technology exhibit on Tuesday, March 15, from 4 to 5 p.m. EDT in room HVC-201 of the Capitol Visitor Center. ... Journalists who do not have U.S. Capitol press credentials must contact the House Press Gallery at 202-225-3945. This event is not open to the public, and media access will conclude at 5 p.m."
Keith's note: An exhibit about NASA technology and its benefit to the public at the Capitol "Visitors Center" - but no one from the public can "visit" the exhibit? FAIL. By Keith Cowing on March 17, 2011 11:08 PM. "NASA's MESSENGER probe has become the first spacecraft to enter orbit about Mercury. At 9:10 p.m. EDT, engineers in the MESSENGER Mission Operations Center at the Johns Hopkins University Applied Physics Laboratory (APL) in Laurel, Md., received radiometric signals confirming nominal burn shutdown and successful insertion of the MESSENGER probe into orbit around the planet Mercury." By Keith Cowing on March 17, 2011 4:38 PM. "Gardens are always a source of surprises. After three weeks of steady growth in space under the watchful eye of Paolo Nespoli, the baby space plants of the Greenhouse in Space project have found a new - and unexpected - travelling companion." By Keith Cowing on March 17, 2011 4:37 PM. "As spring continues to unfold at Saturn, April showers on the planet's largest moon, Titan, have brought methane rain to its equatorial deserts, as revealed in images captured by NASA's Cassini spacecraft. Extensive rain from large cloud systems, spotted by Cassini's cameras in late 2010, has apparently darkened the surface of the moon. The best explanation is these areas remained wet after methane rainstorms." By Keith Cowing on March 17, 2011 4:00 PM. "Opportunity Status for sol 2527-2532: Opportunity completed the in-situ (contact) investigation on the surface target Ruiz Garcia at Santa Maria crater. On Sol 2520 (Feb. 25, 2011), the rover used the robotic arm (Instrument Deployment Device, or IDD) to collect a microscopic imager (MI) image mosaic of Ruiz Garcia. Then, it placed the alpha particle X-ray spectrometer (APXS) down on the target for multi-sol integration. On Sol 2531 (March 8, 2011), the rover backed away from the target and drove about 8.7 meters (29 feet) north to set up for the final wide-baseline stereo imaging, the last imaging before leaving Santa Maria crater." By Keith Cowing on March 16, 2011 11:10 PM. "Nelson had no luck getting NASA officials to pin down the date by which the agency could begin testing Orion atop the core elements of the congressionally mandated rocket. "I want to know how soon you can get testing the initial heavy-lift capability with the proposed funding levels," Nelson told Doug Cooke, NASA associate administrator for exploration systems. Cooke demurred, citing ongoing studies, but said the agency "is trying to get test flights as early as 2016," the year the law says the initial capability must be operational. Cooke also said the president's latest budget request, which increases spending for commercial crew transportation and space technology research, reflects the administration's agenda." By Keith Cowing on March 16, 2011 8:27 AM. "Expedition 26 Commander Scott Kelly and Russian Flight Engineers Alexander Kaleri and Oleg Skripochka safely landed their Soyuz spacecraft on the Kazakhstan steppe Wednesday, wrapping up a five-month stay aboard the International Space Station. Kaleri, the Soyuz commander, was at the controls of the spacecraft as it undocked at 12:27 a.m. EDT from the station's Poisk module. The trio landed at 3:54 a.m. (1:54 p.m. local time) at a site northeast of the town of Arkalyk." By Keith Cowing on March 15, 2011 10:34 PM. Keith's note: According to NASA sources, NASA is planning to kill 2 of the 4 US-led instruments which it originally selected to provide as part of its collaboration with ESA on the ESA/NASA Solar Orbiter mission. This is being done due to launch vehicle cost growth. As such, NASA is planning to cut 50% of its science contribution to the mission, and short-changing the overall benefit to the U.S. from this $400M collaboration. By Keith Cowing on March 15, 2011 9:58 PM. "At its core, NASA's mission remains fundamentally the same as it always has been and supports our new vision: "To reach for new heights and reveal the unknown so that what we do and learn will benefit all humankind." This statement is from the new multi-year 2011 NASA Strategic Plan accompanying the FY 2012 budget request, which all of NASA's Mission Directorates, Mission Support Offices and Centers helped to develop, and encapsulates in broad terms the very reason for NASA's existence and everything that the American public expects from its space program." "The space station itself recently passed a milestone of its own. Last November marked 10 years of a continuous human presence on the space station. Much of that time has been devoted to construction, but the astronauts on board still found time to conduct more than 1,200 experiments that supported the research of more than 1,600 scientists worldwide." "It is important to remember [the NASA Reauthorization Act of 2010] is a law, not just an advisory framework. Compliance is not something we should have to hope for, it is something that we expect and is required. At the same time, the president's budget request proposes a significant increase to the very same areas prioritized by the Administration's last request, which Congress rejected," said Sen. Hutchison." By Keith Cowing on March 15, 2011 2:20 PM. "After more than a dozen laps through the inner solar system and six planetary flybys, NASA's MESSENGER spacecraft will move into orbit around Mercury on at around 9 p.m. EDT on March 17, 2011. The durable spacecraft -- carrying seven science instruments and fortified against the blistering environs near the Sun -- will be the first to orbit the innermost planet." By Keith Cowing on March 15, 2011 2:18 PM. "Chasma Boreale, a long, flat-floored valley, cuts deep into Mars' north polar icecap. Its walls rise about 4,600 feet, or 1,400 meters, above the floor. Where the edge of the ice cap has retreated, sheets of sand are emerging that accumulated during earlier ice-free climatic cycles. Winds blowing off the ice have pushed loose sand into dunes and driven them down-canyon in a westward direction." By Keith Cowing on March 15, 2011 11:40 AM. "MacDonald, Dettwiler and Associates Ltd. (MDA) today announced it has entered into an agreement with Intelsat S.A. as its anchor tenant for its Space Infrastructure Servicing (SIS) vehicle which could be in service by 2015. This is a major step forward for the Richmond, BC headquartered company as it helps create a new commercial space segment. The Space Infrastructure Servicing vehicle is an on-orbit servicing spacecraft that will initially carry up to 2,000 kilograms of fuel and a suite of robotic tools to service satellites of which Intelsat will be the first customer. The servicing of these satellites is expected to extend the life of each satellite from one to five years depending on the customers needs." By Keith Cowing on March 14, 2011 8:22 PM. "Deciding to leave NASA has not been easy, and is something I've been struggling with for the past few months. About a month ago, I mentioned to one of my mentors that "it's a very difficult time to be an entrepreneur at NASA." She responded "is it ever a good time to be an entrepreneur at NASA?" Reflecting on this, I realized that most of my accomplishments at NASA were not at Headquarters, but out in the field where I could roll up my sleeves and work on projects and get stuff done. Whereas I thought I had the best of both worlds being a Headquarters employee stationed in Silicon Valley, I actually had the worst of both worlds... no influence when I can't be in all of those meetings at NASA HQ, with no mandate to manage projects at Ames. As budgets kept getting cut and continuing resolutions from Congress continued to make funding unavailable, I saw my vision for the future slowly slip further from my grasp. So, today, I am announcing that I am leaving the place I dreamed of working as a kid to find a garage in Palo Alto to do what I love." By Keith Cowing on March 14, 2011 7:43 PM. "NASA Goddard Space Flight Center ("GSFC") is looking to enter into a non-funded Space Act Agreement partnership for the development of a climate simulation system referred to hereafter as the "Climate@Home(TM) project." The Climate@Home(TM) project will build a virtual climate simulation supercomputer with contributions from citizens for both their idle computing cycles and local knowledge about climate change." By Keith Cowing on March 14, 2011 7:19 PM. "NASA has signed a $753 million modification to the current International Space Station contract with the Russian Federal Space Agency for crew transportation, rescue and related services from 2014 through June 2016. The firm-fixed price modification covers comprehensive Soyuz support, including all necessary training and preparation for launch, flight operations, landing and crew rescue of long-duration missions for 12 individual space station crew members." Keith's note: $753 million/12 astronauts = $62.75 million/astronaut. "NASA has signed a deal worth 306 million dollars (224 million euros) with Roskomos for six rides to the ISS in 2012 and 2013, or a charge of 51 million dollars per US astronaut." "NASA has signed a $141 million modification to the current International Space Station contract with the Russian Federal Space Agency for crew transportation services planned through the spring of 2012." By Keith Cowing on March 14, 2011 1:57 PM. "Bolden said he was trying to convince Congress that it's not feasible for NASA to move ahead directly to a 130-metric-ton launch vehicle for the Space Launch System authorized by Congress. "We're not going to build a 130-metric-ton heavy-lift vehicle. We can't," he said. "We continue to negotiate and discuss with the Congress why that is not necessary." "NASA Administrator Charles Bolden said at a recent hearing that NASA would not need exploration capabilities until after 2020, although Congress clearly directed NASA to develop the heavy lift system with an initial capability to return to the International Space Station by 2016. Failure to do so will result in continued reliance on the Russians' Soyuz to transport astronauts to the International Space Station. This is unacceptable. NASA should give highest priority to developing the SLS and MPCV programs that build on the tremendous investments that have already been made in the Constellation systems. We cannot, as the NASA Administrator suggests, wait until 2020." By Keith Cowing on March 14, 2011 8:31 AM. "The new "digital" version of the Soyuz spacecraft is having some decidedly analog problems on its maiden voyage. Astronauts will test on-orbit repairs done to its troubled control systems ahead of a scheduled landing next Wednesday. The tests will determine whether the Soyuz can perform a gentle guided descent or instead must rely on a backup emergency "ballistic" landing, involving a much rougher deceleration and landing several hundred kilometers short of the main recovery zone. ... NASA quietly disclosed the situation Thursday on its website in a routine and little read daily "On-Orbit Status Report" for the International Space Station." "Roscosmos Board held a meeting today to discuss the report by Technical Management on Human Space System Flight Testing. The report mentioned an incompliance in operation of the Kvant-V equipment in Soyuz TMA-21 detected during launch campaign at Baikonur. Taking into account the necessity to run additional analysis of the glitch, Soyuz TMa-21 launch is postponed. Failure of a condenser is blamed for the glitch in Kvant-V."
"The first modernized manned spaceship Soyuz TMA-M may have a ballistic landing on Wednesday, NASA said. Soyuz TMA-M commander Alexander Kaleri will test angular speed sensors after the ship undocks from the International Space Station (ISS). The other crewmembers of Soyuz TMA-M are Oleg Skripochka and Scott Kelly. If a problem occurs, the astronauts may experience G8 to G10 in the ballistic return, NASA said. Astronauts experience G3 to G4 in the case of a regular return. NASA explained the planned check of angular speed sensors with the failure of the landing capsule's analog signal processing system, which happened on October 9, 2010, on the second day of Soyuz TMA-M's flight to the ISS. As a result, data from angular speed sensors stopped being displayed on the Neptun-ME console." NASA's Contingent at SXSW: Lessons Learned - For The Rest of Us? By Keith Cowing on March 13, 2011 11:56 AM. Keith's note: NASA employees Nick Skytland @skytland, Chris Gerty @gerty, Stephanie Schierholtz @schierholz. VeronicaMcGregor (JPL) @VeronicaMcG , and Doug Ellison (JPL) @doug_ellison (and others) are currently attending SXSW (South by Southwest), an "Annual music, film, and interactive conference and festival held in Austin.". There are several panels and sessions (like this one chaired by Nick Skytland) that deal directly or partially with space exploration. It will be curious to see if any of these NASA folks write travel reports or make blog postings that describe what they saw - and what they learned - or if they will simply post a few scattered Tweets instead. Indeed, NASA's social media experts spend far too much time talking to each other - and less actually interacting with the public and other co-workers which (so I thought) was the whole point to begin with. One would hope that they'd share what they learned - in some detail - (along with their presentations at SXSW) with the rest of the agency and the public. Curiously, Skytland et al only post their presentations (like the one for today's session) made as NASA employees at opennasa.com - never at NASA.gov. Even though Skytland is travelling as a NASA representative, he uses his personal website address and not NASA's. Many of the sites he discusses are not NASA-sponsored at all. You'd think that a NASA person would be giving a NASA presentation. In addition, Skytland's presentation is not Section 508 compliant - a requirement for all NASA presentations posted online. By Keith Cowing on March 13, 2011 10:08 AM. "NASA's Terra satellite's first view of northeastern Japan in the wake of a devastating earthquake and tsunami reveal extensive flooding along the coast. The Moderate Resolution Imaging Spectroradiometer (MODIS) acquired the top image of the Sendai region on March 12, 2011, at 10:30 a.m. The lower image, taken by Terra MODIS on February 26, 2011, is provided as a point of reference." By Keith Cowing on March 11, 2011 9:06 PM. "Dramatic changes in information and news circulate through blogs, and social media has impacted NASA greatly. While the initial reaction may be to control these outlets, Gerstenmaier has taken a different approach. It has not been uncommon for him to finish a Flight Readiness Review for the shuttle and have a report out about it before leaving the building. Instead of suppressing communication within the reviews, he has invited his public affairs officer to attend and tweet updates. Doing this has enabled him to tell a better NASA story and actually stay in front of the blogs. "Instead of trying to slow down communication, recognize that communication is diverse and fast. How can you now participate in it and use it to your advantage?" By Keith Cowing on March 11, 2011 8:17 PM. "House Appropriations Chairman Hal Rogers today introduced a Continuing Resolution (CR) to fund the federal government at current rates for three weeks -until April 8 - while cutting $6 billion in spending. The legislation (H.J. Res 48) is the second short-term funding extension to prevent a government shutdown while Congressional negotiations continue on a long-term plan to keep the government running through the end of the fiscal year. ... - $63 million - NASA - Cross Agency Support". By Keith Cowing on March 11, 2011 2:12 PM. "NASA is seeking comments from the public on its draft Environmental Assessment (EA) of potential impacts from proposed improvements at the Wallops Flight Facility main base entrance. NASA is proposing to improve the main base entrance to increase personnel safety and decrease congestion. .... The draft EA is available on the internet at: http://wff.nasa.gov/code250/MERP_DEA.html A description of means for submitting comments may be found on the website. Public comments on the draft EA are requested by April 12, 2011." Keith's note: I am not sure how the "public" would ever know about this if it were not for newspapers since Wallops makes no mention of this on their website. I guess the locals are happy that they have newspapers with websites that do NASA's PR work. Oh yes, the web link from Code 250 in this article does not seem to be working. Reader note: "For future reference, most if not all of NASA's URL's must have "www" prepended (e.g., nasa.gov doesn't work, www.nasa.gov does). 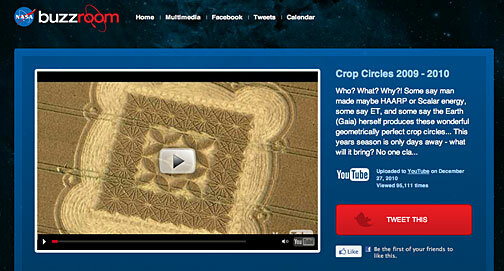 Until this gets fixed by the Wallops' webmaster, try www.wff.nasa.gov/code250/MERP_DEA.html." By Keith Cowing on March 11, 2011 8:59 AM. "While some candidate craters were observed that appeared in LROC data but not in Lunar Orbiter data, these were all very near the edge of discernable feature size and are almost certainly explained by various differences between the images (e.g. sun angle or viewing geometry). While our initial search did not find any discernable new cratering, we have shown that data from the original analog Lunar Orbiter tapes, as recovered by the Lunar Orbiter Image Recovery project, possesses the characteristics necessary to discern new craters at reasonably small sizes. If the entire Lunar Orbiter data set was recovered in this manner it may be possible for future researchers to apply automated methods to detect changes with much better chances of success." By Keith Cowing on March 10, 2011 10:01 PM. "To enable Voyager 1's Low Energy Charged Particle instrument to gather these data, the spacecraft performed a maneuver on March 7 that it hadn't done for 21 years, except in a preparatory test last month. Voyager engineers performed a test roll and hold on Feb. 2 for two hours, 15 minutes. When data from Voyager 1 were received on Earth some 16 hours later, the mission team verified the test was successful and the spacecraft had no problem in reorienting itself and locking back onto its guide star, Alpha Centauri." By Keith Cowing on March 10, 2011 3:42 PM. "Site work has begun on Exploration Park, the high-tech research and office park being developed by The Pizzuti Companies in partnership with Space Florida. Tom Harmer, senior vice president for The Pizzuti Companies, said the initial work includes clearing the site, transporting fill dirt and initial site grading. Work on this phase of the project is expected to take approximately eight weeks to complete, Harmer said." By Keith Cowing on March 10, 2011 3:37 PM. "The Northrop Grumman Foundation announced today that the Foundation is accepting teacher applications for the 2011 Weightless Flights of Discovery program, a unique professional development initiative that places teachers on microgravity flights to test Newton's Laws of Motion and energize students during their formative middle school years. The announcement was made during the National Science Teachers Association's (NSTA) National Conference on Science Education, held in San Francisco this week." By Keith Cowing on March 9, 2011 5:37 PM. Keith's note: Have a look at these ground-based images by Thierry Legault of the ISS including an individual performing an EVA. But ... scroll down. If you are one of those people who can fuse two images (left and right) by crossing your eyes (I am) then you will see that this is a stunning animation -- quite an accomplishment. Alas, I am baffled as to why NASA.gov never links to his stuff. By Keith Cowing on March 9, 2011 5:19 PM. Keith's note: This is one of the more interesting procurement notices I have seen in a while i.e. no actual product or service is actually specified. "NASA/HQ has a requirement for [ENTER BRIEF, CONCISE DESCRIPTION OF THE REQUIRED PRODUCT(S) TO BE ACQUIRED INCLUDING QUANTITIES AND UNITS OF MEASURE AND REFERENCE ANY UPLOADED DOCUMENTS THAT CONTAIN MORE DETAILED SPECIFICATIONS AND/OR A SOW TO THIS SYNOPSIS - i.e The specifications and drawings are linked above or may be accessed at http://prod.nais.nasa.gov/cgi-bin/eps/bizops.cgi?gr=Cπn= .]" Keith's update: They fixed it. By Keith Cowing on March 9, 2011 12:59 PM. "The High Resolution Imaging Science Experiment (HiRISE) camera on NASA's Mars Reconnaissance Orbiter acquired this color image on March 9, 2011, of "Santa Maria" crater, showing NASA's Mars Exploration Rover Opportunity perched on the southeast rim. The rover is the bluish speck at about the four o'clock position on the crater rim (with indicator arrow). North is up. Rover tracks are visible to the west of the crater." By Keith Cowing on March 9, 2011 12:16 PM. "At 11:57 a.m. EST, space shuttle Discovery landed for the final time at NASA's Kennedy Space Center after 202 orbits around Earth and a journey of 5,304,140 miles on STS-133. Discovery's main gear touched down at 11:57:17 a.m. followed by the nose gear at 11:57:28 and wheels stop at 11:58:14 a.m. At wheels stop, the mission elapsed time was 12 days, 19 hours, four minutes and 50 seconds." By Keith Cowing on March 9, 2011 12:03 PM. Keith's note: Looks like Beth Beck has finally decided to fix some major problems with NASA Buzzroom. 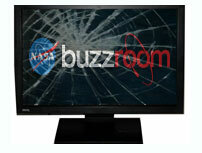 When you visit now you get this message: "We're in the process of making Buzzroom better for our users. We appreciate your patience. Please check back in the future." The sad thing is that it took people outside the agency to notice these problems and bring them to NASA's attention before they took action. Virtually no one inside the agency seemed to have problems with the goofy, off-topic, and sometimes reprehensible content that this website's managers approved for posting - or simply did not notice. By Keith Cowing on March 9, 2011 9:12 AM. "Through this Opportunity Notice NASA seeks to select an Allied Organization for the Nano-Satellite Launcher prize competition to be conducted under the Centennial Challenges Program of NASA Headquarters in Washington, D.C. NASA provides the monetary prize purse (which can be supplemented by outside organizations) but no funding for the conduct of the competition itself." "Through this Opportunity Notice (NOTICE), NASA seeks to identify potential Sponsoring Organizations who may be interested in partnering with Allied Organizations to support prize competitions conducted under Centennial Challenges program (http://www.nasa.gov/challenges ) of NASA Headquarters in Washington, D.C."
How Many Class M Planets Are Out There? By Keith Cowing on March 9, 2011 6:02 AM. "Kepler is a space telescope that searches Sun-like stars for planets. Its major goal is to determine nEarth, the fraction of Sunlike stars that have planets like Earth. When a planet 'transits' or moves in front of a star, Kepler can measure the concomitant dimming of the starlight. From analysis of the first four months of those measurements for over 150,000 stars, Kepler's science team has determined sizes, surface temperatures, orbit sizes and periods for over a thousand new planet candidates. Here, we show that 1.4% to 2.7% of stars like the Sun are expected to have Earth analog planets, based on the Kepler data release of Feb 2011." By Keith Cowing on March 9, 2011 6:00 AM. "A five-time astronaut, [Scott] Parazynski said he's especially eager to tackle projects in the fields of minimally invasive surgery and nanomedicine, with its potential to use targeted drugs to destroy tumors and plaques in arteries. Some inspiration, he admits, comes from Star Trek. "I'm hoping to leverage my background to create the next generation of minimally invasive surgery and diagnostic tools," Parazynski said. "As a physician growing up and watching Star Trek, we all wanted a medical tricorder. So one of the things I'd love to do is think big and push the envelope on what is possible." For those who don't grok Spock, a "tricorder "is a fictional device that can scan a person and immediately diagnose a disease or injury." By Keith Cowing on March 8, 2011 11:34 AM. "Ten days from now - on March 17 - the MESSENGER spacecraft will execute a 15-minute maneuver that will place it into orbit about Mercury, making it the first craft ever to do so, and initiating a one-year science campaign to understand the innermost planet. Starting today, antennas from each of the three Deep Space Network (DSN) ground stations will begin a round-the-clock vigil, allowing flight control engineers at the Johns Hopkins University Applied Physics Laboratory (APL) in Laurel, Md., to monitor MESSENGER on its final approach to Mercury." By Keith Cowing on March 8, 2011 10:00 AM. "The 2013 Decadal Survey will provide an outstanding science program for the next decade building on our strong foundation of success in planetary science. The National Research Council will release the Survey on Monday, March 7, at 5:30 pm Central time. The National Research Council (NRC) conducts studies that provide a science community consensus on key questions posed by NASA and other U.S. Government agencies. The broadest of these studies in NASA's areas of research are decadal surveys. As the name implies, NASA and its partners ask the NRC once each decade to look out ten or more years into the future and prioritize research areas, observations, and notional missions to make those observations." "Space exploration has become a worldwide venture, and international collaboration has the potential to enrich the program in ways that benefit all participants. The program therefore relies more strongly than ever before on international participation, presenting many opportunities for collaboration with other nations. Most notably, the ambitious and complex Mars Sample Return campaign is critically dependent on a long-term and enabling collaboration with the European Space Agency (ESA)." "A new report from the National Research Council recommends a suite of planetary science flagship missions for the decade 2013-2022 that could provide a steady stream of important new discoveries about the solar system. However, if NASA's budget over that decade cannot support all of these missions, the agency should preserve smaller scale missions in its New Frontiers and Discovery programs first and delay some or all of the recommended large-scale missions, the report says." "Planetary scientists would love to have some samples collected on Mars for delivery back on Earth, and they're itching to get a closer look at Europa, a moon of Jupiter that may harbor a hidden ocean and perhaps life as well. But they might be stymied during the decade to come, due to the federal government's tightening financial circumstances. The Mars and Europa missions are the top priorities for flagship robotic missions emerging from a big-picture scientific assessment known as the Decadal Survey. Over the past couple of years, the survey's organizers have received input from more than 1,600 planetary scientists, and the final results were released today in the form of a National Research Council report titled "Visions and Voyages." "The decadal-survey committee's recommendations, released on 7 March at the Lunar and Planetary Science Conference in Houston, Texas, relied partly on President Barack Obama's 2011 budget request, which projected that NASA's annual planetary-science funding would grow from its current allocation of $1.36 billion to more than $1.6 billion by 2015. But Obama's 2012 budget foresees that funding dropping to $1.2 billion in 2016. On 3 March, planetary-sciences division director James Green told the NASA Advisory Council's science committee that this would create indefinite delays for both the Mars and Europa missions." By Keith Cowing on March 8, 2011 9:10 AM. "A National Research Council steering committee and six panels that are advising NASA on innovative technologies for future missions is holding a series of public workshops to review 14 draft NASA technology "road maps" and solicit input from the public, the aerospace community, and policymakers. The study will provide recommendations to NASA to help chart a course for technologies and concepts that could benefit future earth and space science missions and also contribute to critical national and commercial needs in space technology." By Keith Cowing on March 8, 2011 9:02 AM. "We also think that commercial crew LEO transport has the potential (and, many believe, high probability) of providing crew transport at a far lower cost. And not only should these alternatives be cheaper than a full NASA development program, they also should come on line more quickly, relieving our country of its soon-to-be complete dependence on Russia for access to LEO and the international space station. As a result of these factors, there is now a growing consensus that our path into the future should lie in promoting a commercial human space launch program in LEO, and that such systems will be substantially safer and less expensive than the shuttle system they will replace." Continue reading Update on Richard Hoover and His Research Paper. By Keith Cowing on March 7, 2011 4:17 PM. Keith's 4:25 pm EST update: Just posted on NASA Watch in the comments section: "The statement "This paper was submitted in 2007 to the International Journal of Astrobiology. However, the peer review process was not completed for that submission. "Is not true, The paper was rejected, after peer review. Rocco Mancinelli, Ph.D., Editor, International Journal of Astrobiology." Continue reading NASA Statement on Astrobiology Paper by Richard Hoover. By Keith Cowing on March 7, 2011 10:12 AM. "Many scientists have examined thousands of meteorites in detail over the past 50 years without finding any evidence of fossil life," David Morrison, senior scientist at the NASA Astrobiology Institute at Ames Research Center, told me in an e-mail. "Further, we know a great deal about the conditions on the parent objects of the meteorites, which (not counting the few meteorites from the moon and Mars) were rather small, not at all like planets. "I would therefore invoke Carl Sagan's famous advice that extraordinary claims require extraordinary evidence. At a bare minimum this would require publication in a prestigious peer-refereed scientific journal -- which this is not. Cyanobacteria on a small airless world sounds like a joke. Perhaps the publication came out too soon; more appropriate would have been on April 1," Morrison said." Continue reading MSFC Astrobiologist's Shaky Claim: He's Found Life in A Meteorite (Updated). By Keith Cowing on March 7, 2011 8:08 AM. "Rise to the edge of space, freefall for 50,000 feet, fly through clouds, and land gently in bushes"
"A balloon with a student-oriented payload shot high resolution photos and video from an altitude of over 110,000 feet of Space Shuttle Discovery as it climbed into space." By Keith Cowing on March 6, 2011 6:01 PM. - The National Aeronautics and Space Administration (NASA) is funded at $18.5 billion, a reduction of $461 million from the FY 2011 request. This is $412 million more than the House level. - Preserves NASA portfolio balanced among science, aeronautics, technology and human space flight investments, holding NASA's feet to the fire to build the Orion Multipurpose Crew Vehicle and the heavy lift Space Launch System. - Does not provide for requested, but new, long-range space technology research activities." By Keith Cowing on March 5, 2011 7:07 PM. "But despite the bleak fiscal forecast, Wolf and other House lawmakers questioned NASA's decision to request less funding than recommended in the authorization bill for the new heavy-lift launch vehicle and space capsule that the law says should be operational by 2016. "Your request has certainly sacrificed progress on the development of the Space Launch System and Multi-Purpose Crew Vehicle," Wolf said, referring to the $2.8 billion NASA requested for the efforts next year, $1.2 billion less than the roughly $4 billion authorized in the law. "The levels provided in your budget for these activities virtually guarantee that NASA won't have core launch and crew capabilities in place by 2016." "[Rep. Ralph] Hall was joined in his criticism by ranking member Eddie Bernice Johnson (D-Texas), who said she was disappointed by the president's budget request. "I had thought that the Administration agreed with the compromise that was enacted into law, but I am afraid that I do not see it reflected in the proposed NASA budget request," Johnson said, telling Bolden he needs to work with lawmakers, "not simply tell us what you can't do." "The most constructive approach for all of us here is to consider the budget request that you will present today as the beginning of the discussion, not the end." "Bolden argued that the 2012 budget request does follow the guidance of the bill. "I get your message loud and clear and so does the president," Bolden said. "I think the budget does, in fact. reflect following your guidance." By Keith Cowing on March 5, 2011 12:32 PM. 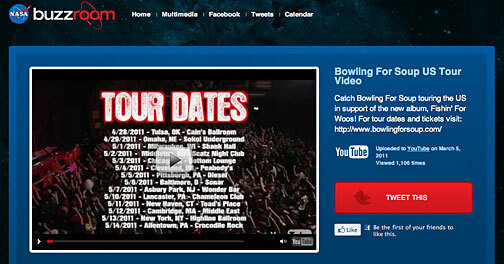 Keith's note: Right now a featured video on NASA Buzzroom is "Bowling For Soup US Tour". (original on YouTube). Is this appropriate? No mention of outer space. So ... what do you do? If you go to NASA Buzzroom, and scroll to the bottom of the page you will see this notice: "This site collects community content about NASA. We invite you to join the conversation! If you find something you don't think belongs, please let us know! Page Last Updated: March 6th, 2011; Page Editor: JESS3; NASA Official: Beth Beck" One small problem: they do not provide a link or an email address. So ... how does one "let them know"? By Keith Cowing on March 4, 2011 1:53 PM. "NASA has announced the winners of the 2010 NASA OPTIMUS PRIME Spinoff Award. The contest encouraged students to produce short, creative videos about their favorite technology from NASA's Spinoff 2009 Publication. NASA collaborated with Hasbro using the correlation between the popular TRANSFORMERS brand, featuring its leader OPTIMUS PRIME, and spinoffs from NASA technologies created for aeronautics and space missions used here on Earth. The goal was to help students understand how NASA technology 'transforms' into things used daily." By Keith Cowing on March 4, 2011 9:04 AM. "Reisman, who holds a doctorate in mechanical engineering, joined NASA in 1998. Before flying in space, he served in multiple technical roles including work supporting robotics and the advanced vehicles branch of the Astronaut Office." "Space Exploration Technologies (SpaceX) is proud to announce that NASA astronaut Garrett Reisman is joining the company as a senior engineer working on astronaut safety and mission assurance. Dr. Reisman will join former NASA astronaut Ken Bowersox's team in preparing SpaceX's Falcon 9 rocket and Dragon spacecraft to carry astronauts." By Keith Cowing on March 4, 2011 7:25 AM. "NASA's Glory mission launched from Vandenberg Air Force Base in California Friday at 5:09:45 a.m. EST failed to reach orbit. Telemetry indicated the fairing, the protective shell atop the Taurus XL rocket, did not separate as expected about three minutes after launch." "P-PODs are aluminum containers measuring about 5 inches square by about 16 inches long. One P-POD will carry three CubeSats as an auxiliary payload aboard a Taurus XL on NASA's Glory mission." "NASA's previous launch attempt of an Earth science spacecraft, the Orbiting Carbon Observatory onboard a Taurus XL on Feb. 24, 2009, also failed to reach orbit when the fairing did not separate. NASA's Orbiting Carbon Observatory Mishap Investigation Board reviewed launch data and the fairing separation system design, and developed a corrective action plan. The plan was implemented by Taurus XL manufacturer Orbital Sciences Corporation. In October 2010, NASA's Flight Planning Board confirmed the successful closure of the corrective actions." "NASA's OCO satellite to study atmospheric carbon dioxide launched aboard a Taurus XL rocket from Vandenberg Air Force Base in California on Feb. 24 at 4:55 a.m. EST, but it failed to reach orbit. The Mishap Investigation Board ... verified that the Taurus launch vehicle fairing failed to separate upon command." By Keith Cowing on March 4, 2011 7:00 AM. 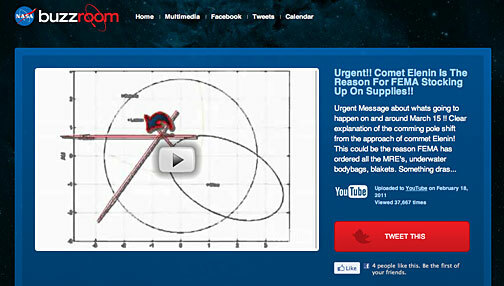 Keith's note: Yesterday I made note of a broken website - NASA Buzzroom's video page. One feature of this site is to grab videos posted on YouTube - automatically - and post them on a nasa.gov webpage and add a comment feature. Nice idea - it lets people see what others think about NASA. One small problem - humans are not in the loop at NASA. At one point I found a video that had been on nasa.gov for weeks that depicted a bloody lynching and featured a non-stop stream of profanity. NASA eventually got around to deleting it - once I complained (Google cached version). I complained about lots of other videos that simply had no reason whatsoever to be on a taxpayer-funded space agency website. Eventually, once someone at NASA saw these videos mentioned by me, they were removed. This process seems to be working backwards. I find these videos simply by looking at the video page. NASA deletes them - but only when I make public note of their location. The NASA folks seem to be utterly incapable of making a decision as to what is in appropriate on their own - or identifying inappropriate videos that have been on their site for weeks (or longer). Nor are they able to fix the problem inherent in this website's design in the first place. Given the way they set up this site, it would seem that no one in SOMD's crack Internet squad ever tested this website before putting it online. 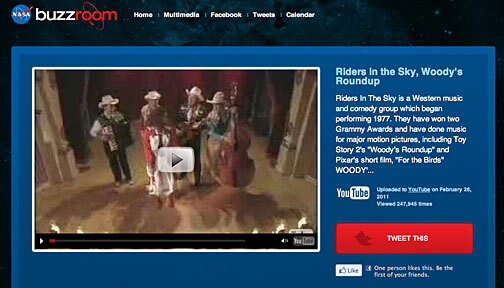 To compound things, they simply take videos off of their webpage because one person (me) complains. That's not right. As such, they clearly don't have any established guidelines for removal of videos either. Right now a clip from the notoriously horrid Howard the Duck from the 1980s is gracing a nasa.gov page. It is harmless but pointless when it comes to space exploration. The NASA SOMD Internet guys will eventually delete it (this is the video on YouTube). But they will only delete it because I complained. FAIL. Curiously, while NASA told me - officially - that the NASA lawyers had told them - that they could not link to this rather popular video "NASA - The Frontier Is Everywhere" that went viral a month or so ago, this NASA Buzzroom website links to it. So ... there is a bright side to the way this page works. 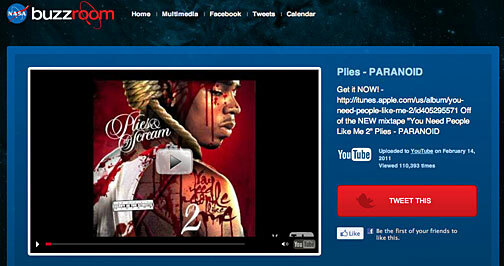 Too bad the people who run this site do not take its design or upkeep seriously. Continue reading NASA Buzzroom Is Broken. Please Fix It. (Updated with SOMD Response). NASA ISS Payload Integration: Forever Slow? By Keith Cowing on March 3, 2011 11:52 PM. "The National Laboratory Office sponsored some payloads that went into orbit in as little as 6 months, but that is not the norm at this time. A developer is already in the assembly process on their end for the payload, rather than in the development stage of their idea. An amazing turnaround like this is for known re-flight science, not for new payloads being assembled. What we are trying to do with National Lab is to use the processes and manage the integration in such a way that we can bring things in later than the normal flow. This is contingent on the National Laboratory model of the commercial or government agency having their funding and development ready to bring to the table. If they are waiting for anticipated funds to move forward with development, this significantly delays the progress." Keith's note: Nice words but actions, as they say, speak louder. NASA's Space Station team (Mark Uhran et al) have had 20 years to figure this out and yet it still takes years, ponderous paperwork, and large piles of money to get virtually any payload onto the ISS. If Uhran's team really wants to be a "National Laboratory" in more ways than just name, then they need to do vastly better in this regard. Already (see below), things that could have been led by NASA in the past decade or so via on-orbit research had surged ahead on the ground because the agency has dragged its feet and is incapable and/or unwilling to try and find a way to make this amazing facility useful within the time frames that industry and academia work IN THE REAL WORLD. Alas, the ISS National LAB CAN simply seeks to replicate all of NASA's current bad habits, adds a new name and logo and calls it "new". It is not "new" by any stretch of the imagination and NASA is only doing this because Congress got frustrated and ordered them to do so - in law. Nanoracks are indeed cool and are in synch with the experimental mindset resident within many business and universities these days. If NASA is really paying attention and not just treating these Nanorack-class payloads as a novelty, they could serve to transform the ponderous process NASA uses to put payloads on the ISS. If, that is, NASA really wants this to happen and is not just doing this to pay lip service to a trendy concept. Right now, by the author's own admission these fast integration times are "not the norm at this time." It needs to be the norm - for all payloads. "With the research results presented in these two papers, it would seem that structural information for biological molecules can now be obtained from vanishingly small biological samples - so called "nanocrystals" using a hard X-ray laser - on Earth - no space station required. So much for the official story NASA has told for 20 years that the ISS is crucial for such work." By Keith Cowing on March 3, 2011 4:38 PM. "GAO assessed 21 NASA projects with a combined life-cycle cost that exceeds $68 billion. Of those 21 projects, 16 had entered the implementation phase where cost and schedule baselines were established. Development costs for the 16 projects had an average growth of $94 million--or 14.6 percent--and schedules grew by an average of 8 months. The total increase in development costs for these projects was $1.5 billion. GAO found that 5 of the 16 projects were responsible for the overwhelming majority of this increase. The issue of cost growth is more significant than the 14.6 percent average would indicate because it does not capture the cost growth that occurred before several projects reported baselines in response to a statutory requirement in 2005." By Keith Cowing on March 3, 2011 4:29 PM. 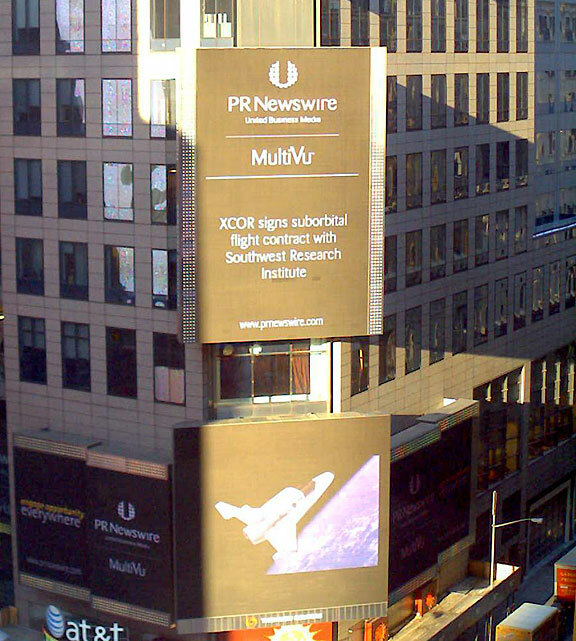 Image: PR Newswire press release regarding SwRI/XCOR suborbital flight announcement as seen in Times Square in New York City. Larger image. "The Commercial Spaceflight Federation is pleased to announce that the Next-Generation Suborbital Researchers Conference (NSRC) held in Orlando, Florida, this week set records for the number of presentations, sponsors and attendees. The annual conference brings the research and education communities together with suborbital vehicle providers and government funding agencies to explore the exciting new era of suborbital spaceflight. CSF is a proud co-sponsor of the event, which was attended by about 350 people." By Keith Cowing on March 3, 2011 3:25 PM. "Many of NASA's facilities are in degraded condition and its maintenance backlog continues to grow each year. NASA's deferred maintenance estimate for all its facilities increased from $1.90 billion in fiscal year (FY) 2005 to $2.55 billion in FY 2010. Continued deferral of facility maintenance could result in unsafe working conditions and higher annual maintenance costs. From FY 2005 through FY 2009, deferred maintenance as a percentage of current replacement value increased, indicating that NASA's facilities were deteriorating. Although the overall deferred maintenance estimate in FY 2010 increased by approximately $6 million, deferred maintenance as a percentage of current replacement value decreased, indicating a slight improvement in the condition of NASA's facilities. This occurred due to NASA's efforts to replace or refurbish aged facilities." By Keith Cowing on March 3, 2011 2:20 PM. "Following multiple schedule delays and substantial cost growth, in 2009 the JWST Project received $75 million in Recovery Act funding intended to sustain the Project's workforce at a consistent level and maintain the baseline schedule for key development activities. We found that in using these funds, the JWST Project adequately addressed the requirements of the Recovery Act and related OMB guidance and delivered measureable outcomes consistent with Agency program and project plans and the goals of the Act. Specifically, we found that the $75 million in Recovery Act funds enabled 454 jobs to be retained on the JWST Project in the fourth quarter of FY 2009 and 149 jobs in the first quarter of FY 2010." By Keith Cowing on March 3, 2011 10:12 AM. Urgent!! Comet Elenin Is The Reason For FEMA Stocking Up On Supplies!! "Urgent Message about whats going to happen on and around March 15 !! Clear explanation of the comming pole shift from the approach of commet Elenin! This could be the reason FEMA has ordered all the MRE's, underwater bodybags, blakets. Something dras..."
Keith's note: The original video is posted here on YouTube. There is another Elenin-related video posted on NASA.gov here. This video sounds like fun too: UFO - Moon Rising Earth Shattering NASA Lies pt1of7. 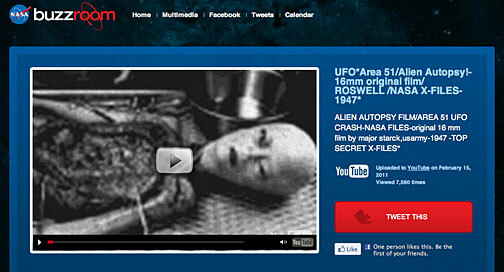 And let's not forget about ET dissections: UFO*Area 51/Alien Autopsy!-16mm original film/ ROSWELL /NASA X-FILES-1947*. 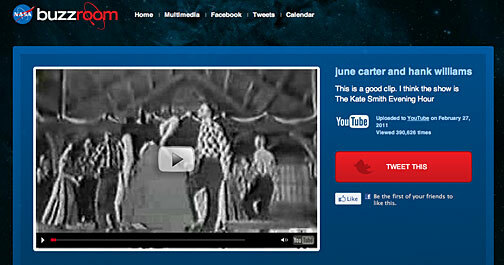 And, of course, it is nice to see NASA Buzzroom hosting a discussion on the topic of "Tennessee Ernie Ford and June Carter - Together!" What actually angers me is that NASA overtly posts/hosts these goofball videos and lets people post whatever they want - no matter how bizzarre - again appearing on a NASA.gov page. But I get official NASAese telling me why the agency cannot link to those recent, wonderful NASA videos that were done on the agency's behalf (this one and this one for example). It seems to be, by virtue of posting these goofy videos, that NASA has actually set a de facto precedent whereby it can point to (host) third party things of clear value as well. Either that, or no one at NASA understands (or cares about) the legal issues. Most annoyingly, NASA SOMD posts a link to a fan video (original link since the NASA web scrubber will soon remove it) featuring repurposed Carl Sagan footage from "Cosmos" on YouTube - but yet NASA won't link to these other videos - also using Sagan - citing legalese as the reason why. Where's the consistency? Keith's update: Well it looks like this finally got someone's s attention at NASA SOMD EPO. Obviously they were not paying attention to any of this. They are now furiously scrubbing this site for videos that they do not want up. I made screen grabs of a bunch of them (below). Let's see if NASA finds all of them. NASA SOMD's Beth Beck is aware of all of this - yet after being notified she still allows a NASA.gov web page that features this video - one which contains a non-stop stream of profanity and imagery showing a bloody lynching - to stay online. How did it even get there in the first place? I give up. Keith's update: Beth finally got around to having the video removed - but it is cached here at Google as it was more than a week ago. 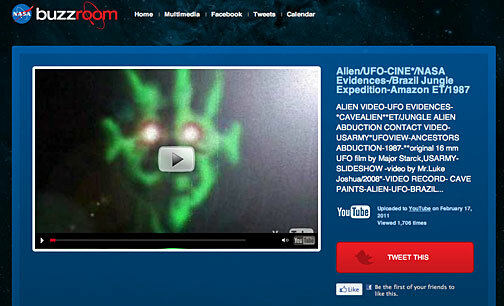 There is another video linked to by NASA Buzzroom that has loads of profanity etc. in it. Lets see if the crack Internet squad at NASA Buzzroom can find it. 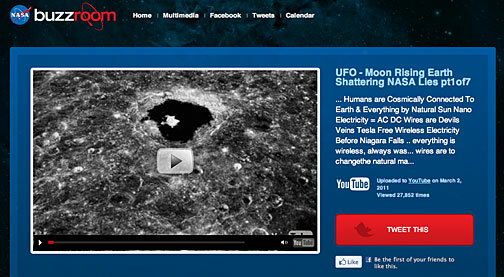 Continue reading Pseudoscience and Profane Videos Featured Online at NASA.gov. By Keith Cowing on March 3, 2011 9:07 AM. "The 45th Space Wing is set to launch an Atlas V Evolved Expendable Launch Vehicle from Space Launch Complex 41 on March 4, 2011. The rocket will carry an Air Force X-37B Orbital Test Vehicle (OTV). The launch window for this Air Force mission opens at 3:39 p.m. EST." By Keith Cowing on March 2, 2011 4:16 PM. "NASA's Office of Chief Technologist has announced the "NASA Innovative Advanced Concepts (NIAC)" Phase I Solicitation is now open. The NIAC Program seeks to inspire and nurture revolutionary concepts that could transform future aerospace endeavors. NIAC will fund early studies of visionary, long term concepts - aerospace architectures, systems, or missions (not focused technologies). The goal of NIAC is to give visionary ideas a chance. NASA recognizes that concepts to transform the future may come from innovators across the nation, so this exciting program is open to everyone. If you have a revolutionary concept that NASA should consider, you are encouraged to submit a NIAC proposal." By Keith Cowing on March 2, 2011 12:23 PM. "I am concerned that the future of our space program is in serious jeopardy. With the retirement of the Space Shuttle, NASA faces a critical period and needs to focus its limited resources to sustain our leadership in space." "Because these are tough fiscal times, tough choices had to be made. But the proposed FY 2012 budget funds all major elements of the Authorization Act, supporting a diverse portfolio of programs, while making difficult choices to fund key priorities and reduce other areas in order to invest in the future." "While expressing strong support for the President and admiration for Mr. Bolden's leadership, Congresswoman Johnson said that she was disappointed with the request, especially in light of all the work that Congress undertook last year to forge a constructive path forward for the nation's space program." By Keith Cowing on March 2, 2011 8:17 AM. "Suborbital flights that would carry passengers, experiments and satellites from Kennedy Space Center and Cape Canaveral Air Force Station, launching a new job-creation industry here. The potential was the focus of attention Monday at a University of Central Florida conference that brought together industry leaders to discuss ways to advance the initiative. It's a smart move and one that Space Florida, the state's space-development agency, is correctly pressing as part of its strategy to diversify the space industry with the shuttle's retirement imminent." By Keith Cowing on March 2, 2011 7:10 AM. "Former NASA astronaut John Mike Lounge, 64, died Tuesday morning. All of us at the Johnson Space Center are deeply saddened by the passing of former astronaut Mike Lounge, said Michael Coats, Director, Johnson Space Center. I personally had the pleasure of working with Mike in one capacity or another for more than 30 years. He had an unwavering love of country and dedication to our nations space program, as evidenced by a sterling career as a naval aviator and astronaut, and veteran of three space shuttle missions. His many friends at Johnson are thinking of Mikes family during this difficult time." "Mike was a tremendous supporter of the commercial spaceflight industry. The last year and a half he put in countless volunteer hours to support and advocate for all that we are trying to achieve. He was a good friend with a big heart, and he will be missed tremendously. Our thoughts are with his family during this difficult time." By Keith Cowing on March 2, 2011 7:00 AM. "Today the Challenger Center for Space Science Education (Challenger Center) joins the Coalition for Space Exploration (Coalition) as a Partner level member to educate and inspire a new generation of aerospace workers and space explorers. The announcement was made at the Next Generation Suborbital Researchers Conference in Orlando. Challenger Center and the Coalition both strive to ensure that America remains a leader in space, science and technology. One important facet of that leadership includes a well-trained and competitive workforce which begins with a heightened interest in science, technology, engineering and math (STEM) education." By Keith Cowing on March 1, 2011 4:56 PM. "Dear Members of Congress: We, the undersigned space leaders--over 50 of us, are strong supporters of human spaceflight. We are writing to urge you to fully fund NASA's plan to use commercial companies to carry crew to the Space Station because it is critical to the health of the Nation's human spaceflight efforts. We are a diverse group, but we are only a tiny fraction of the Nation's citizens who support U.S. leadership in human space flight and the development of competitive commercial human spaceflight." By Keith Cowing on March 1, 2011 3:56 PM. "NASA has announced program office assignments at three NASA field centers to align the president's fiscal year 2012 budget request and the NASA Authorization Act of 2010. The agency also has released three Space Technology Program solicitations. NASA will create new program offices to manage human spaceflight activities associated with the development of the Space Launch System, the heavy-lift rocket that will carry humans beyond low Earth orbit; the Multi-Purpose Crew Vehicle, the next human exploration spacecraft; and commercial spaceflight vehicles."